You'll have double the fun with these brilliant themes. 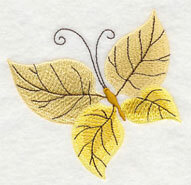 Explore the wonders of autumn with delicate animals, autumn collages, and beautiful flowers. 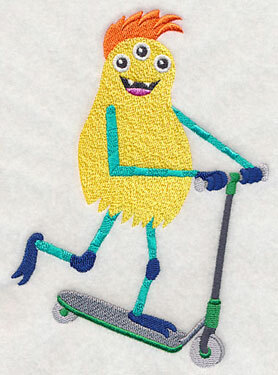 Then, your creative muse will delight in furry monsters on the go, retro robots, and scenes featuring well-known monsters. 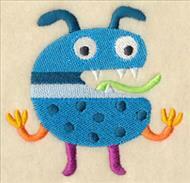 Stitch as terrific additions to kids decor, gifts, and more. 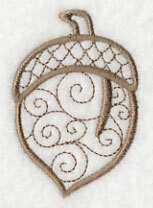 Scroll down the page to see these designs, new today and on sale for you now! 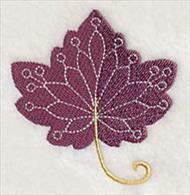 Capture the beauty of changing leaves with these delicate and detailed designs. 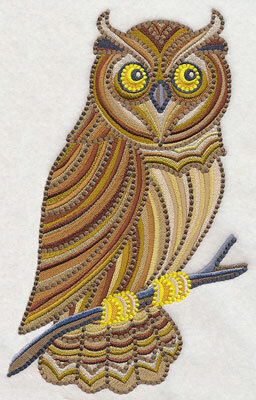 The use of colors in varying shades and unique stitch types give them a breathtakingly beautiful style. 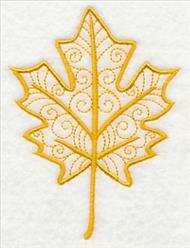 6.90" x 9.45" and 5.83" x 7.99"
6.88" x 8.14" and 6.35" x 7.50"
5.85" x 6.92" and 4.85" x 5.74"
A red oak leaf, aspen leaf, and maple leaf make fabulous additions to your fall projects. 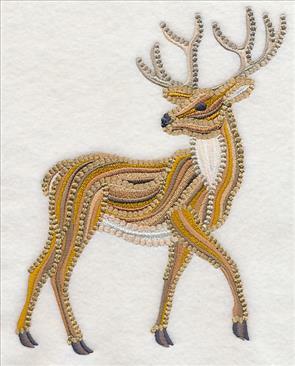 Or, stitch a wild woodland animal instead! 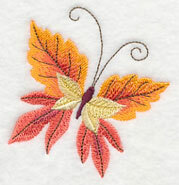 The intricacy and attention to detail make these autumn designs stand out on a wide variety of embroidery projects. 6.91" x 8.89" and 6.07" x 7.81"
5.51" x 7.09" and 4.87" x 6.26"
Varying levels of texture and color give these woodsy designs an eye-catching and impressive look. 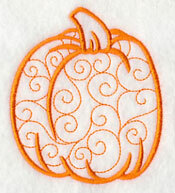 Stitch them on pillows, tote bags, quilts, and other seasonal projects. 6.89" x 10.94" and 5.87" x 9.31"
8.71" x 6.91" and 7.80" x 6.19"
7.00" x 5.55" and 6.12" x 4.86"
Bring the beauty of autumn to every room in the house. Throw pillows are beautiful for the living room, and towels with fall elements are gorgeous in the bath. 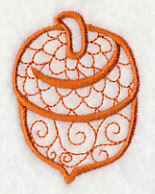 And, freshen up the kitchen with autumn motifs! 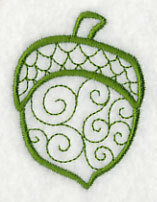 Free project instructions demonstrate how to make an acorn-shaped pot holder. 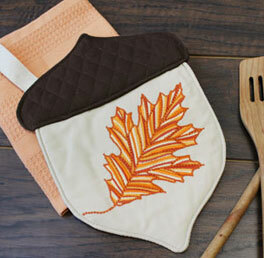 Make coordinating towels and placemats, too. 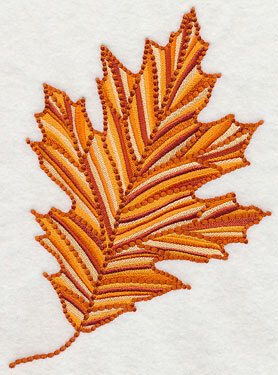 Click here for the free tutorial for this fall project! Bright, blooming flowers shine against an echo of autumn foliage. Here, a cosmos and a pair of marigolds mimic the beauty of the fall landscape in these stunning designs. 6.33" x 7.81" and 5.69" x 7.01"
6.28" x 7.81" and 5.51" x 6.85"
4.83" x 6.01" and 3.12" x 3.88"
Each of the colorful flowers blossom regularly in the fall season, and are striking when stitched on quilts, wall hangings, table linens, and more. 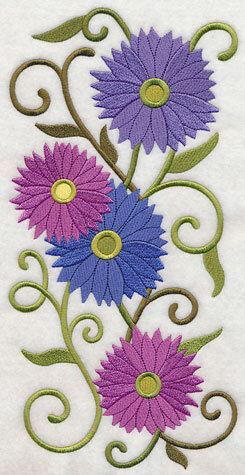 Stitch your favorite (like the black-eyed susans or asters here), or mix-and-match the designs for a series of projects. 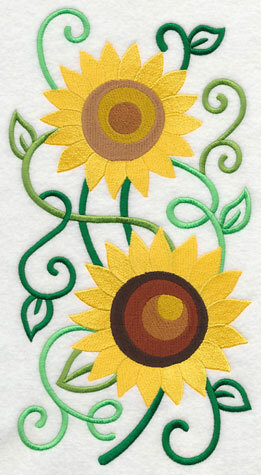 6.47" x 7.81" and 5.83" x 7.03"
6.48" x 7.80" and 5.82" x 7.01"
4.86" x 5.85" and 3.23" x 3.90"
A sunflower and a chrysanthemum finish the collection of bright, radiant flowers. 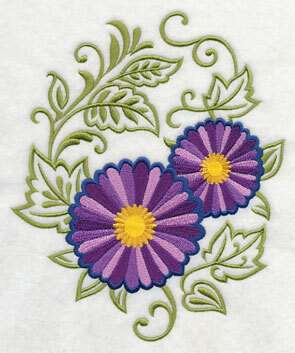 The combination of the brilliant blooms and simple echoes adds a unique, eye-catching appeal to these designs. 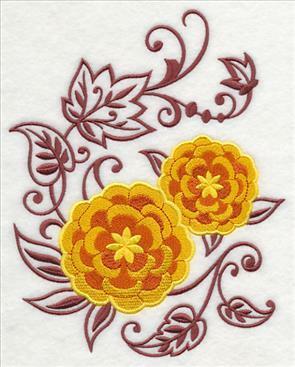 6.56" x 7.79" and 5.86" x 6.97"
6.63" x 7.80" and 5.86" x 6.90"
Stitch a garden full of fall flowers on your next embroidery project. 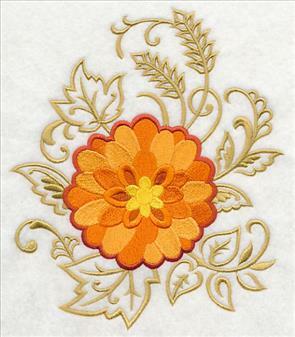 **Md - Designs smaller than 5"x 7"
Graceful floral sprays are a striking way to add color and autumn appeal to table linens, tote bags, pillows, and more. 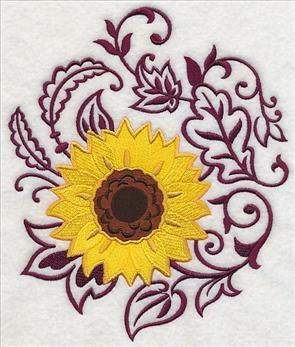 These asters and sunflowers are particularly gorgeous blooms to stitch -- pair them on one project, or pick your favorite to stitch alone. 5.91" x 11.75" and 4.73" x 9.40"
6.32" x 11.75" and 5.06" x 9.40"
4.20" x 7.80" and 3.69" x 6.86"
Chrysanthemums, also often described as mums or chrysanths, are also a common autumn flower known for their beautiful pink flowerets. 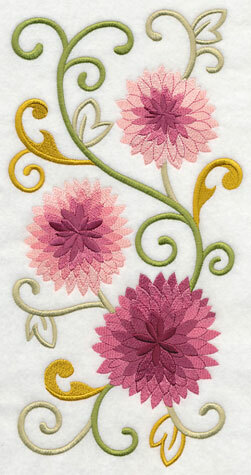 Stitch this graceful chrysanthemum spray on bath linens, jacket backs, and more. 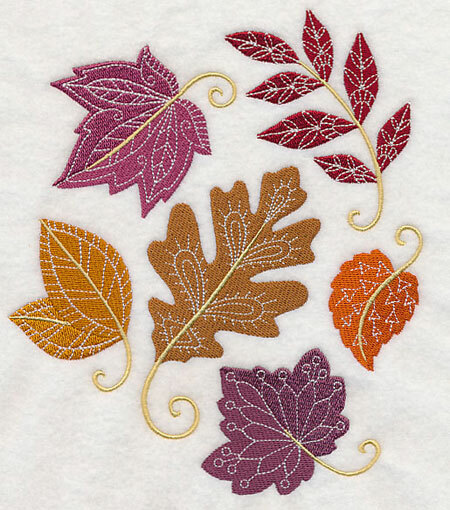 6.08" x 11.75" and 4.87" x 9.40" and 4.04" x 7.80" and 3.56" x 6.86"
Beautiful changing autumn leaves make up the wings for the fluttering butterflies in this autumn collage. 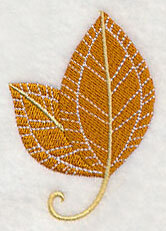 Stitch it on framed pieces, tote bags, and other fall projects. 6.88" x 9.09" and 5.81" x 7.67" and 4.88" x 6.44"
Each of the stunning butterflies have been separated from the design above and are available for individual purchase. Use them together with the collage for a matching set. 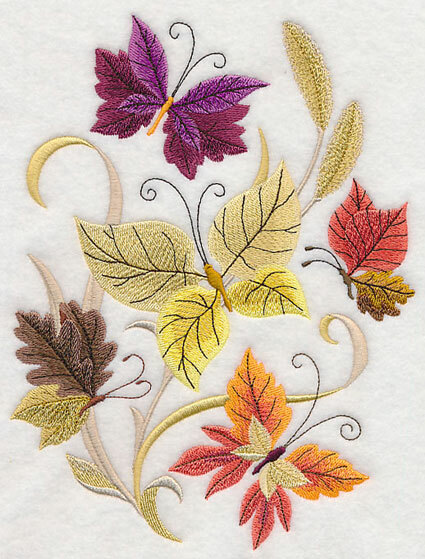 1.95" x 2.44" and 1.38" x 1.74"
2.39" x 2.58" and 1.70" x 1.83"
Intricate running stitches in white lay atop the bold fall colors of these autumn leaves, adding exquisite detail and sophisticated style. 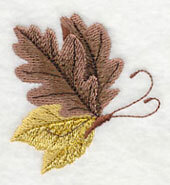 Stitch this leaf medley to bring an elegant, seasonal look to your embroidery projects. 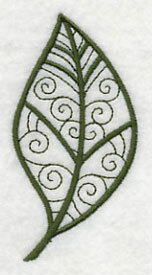 6.69" x 7.78" and 5.86" x 6.81" and 4.87" x 5.65"
Each of the leaf designs are ready to be stitched alone, too. 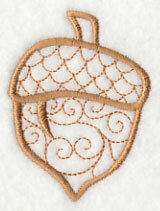 Use them as subtle, yet striking additions to your next project. 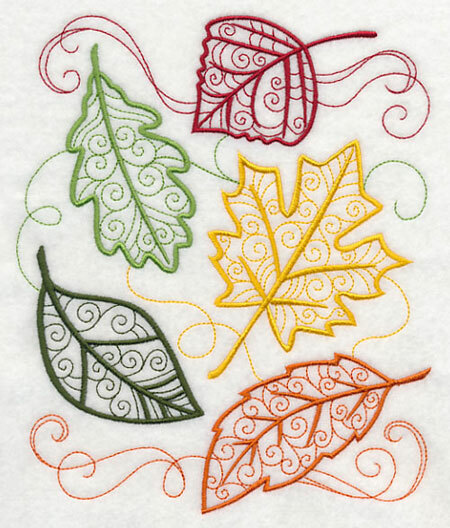 2.06" x 2.95" and 1.50" x 2.15"
1.47" x 2.41" and 1.07" x 1.76"
A swirling, whirling collage of falling leaves will add the perfect autumn touch to your next embroidery project. 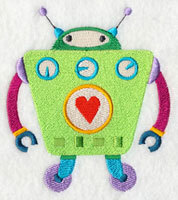 Stitch on pillows, tote bags, and more! 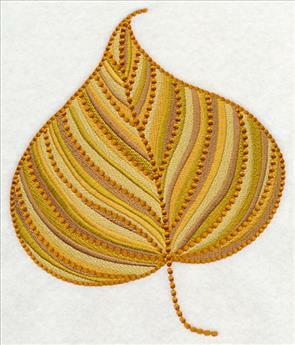 6.62" x 7.82" and 5.85" x 6.91" and 4.84" x 5.72"
These spectacular leaves are all available for individual purchase, too. 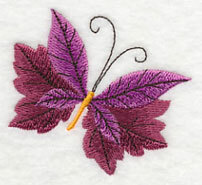 Use in conjunction with the collage above, or stitch singly for extra impact. 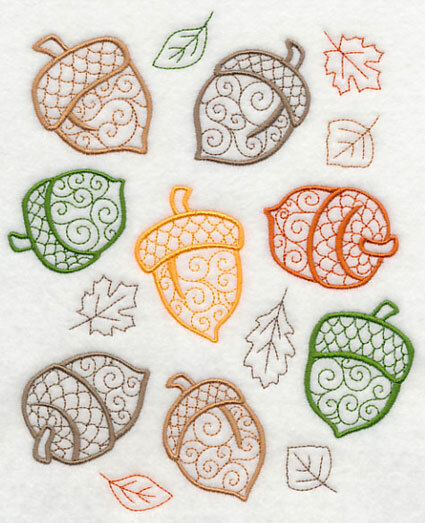 3.26" x 4.40" and 2.39" x 3.22"
1.87" x 3.66" and 1.37" x 2.68"
The swirling details of the leaf collage above are mimicked in this collection of autumn acorns. 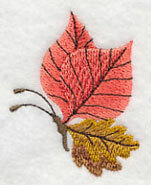 Miniature falling leaves round out this design -- stitch on placemats, towels, and other projects. 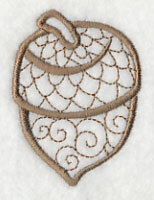 6.40" x 7.80" and 5.63" x 6.85" and 4.87" x 5.92"
These acorns can be stitched to accompany the collage above. 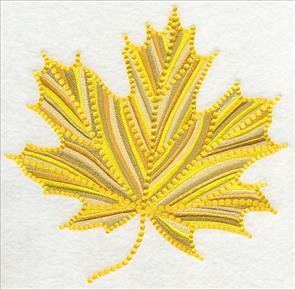 Use as a placemat-napkin pair, an apron-tea towel combo, or all together on a quilt! 1.86" x 2.52" and 1.17" x 1.59"
1.81" x 2.50" and 1.26" x 1.73"
1.83" x 2.54" and 1.27" x 1.76"
Each of these swirling designs feature light stitches and open spaces, making them quick-stitching options for your seasonal projects. 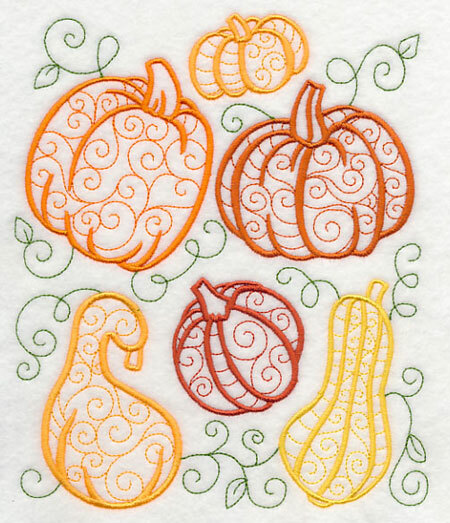 Here, gourds and pumpkins are ready to be picked and set out to decorate for fall. 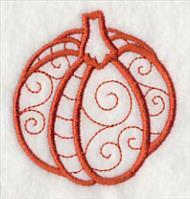 6.61" x 7.84" and 5.77" x 6.84" and 4.85" x 5.75"
Pick your favorite pumpkin or gourd to stitch alone, or use them all! They're a great way to compliment the medley above. 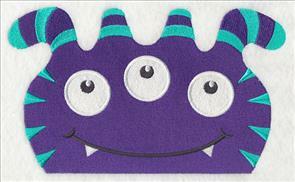 3.45" x 3.16" and 2.32" x 2.12"
1.81" x 3.69" and 1.34" x 2.72"
A peeking monster with a toothy grin is a terrific addition to the bottom of towels, blankets, bibs, and more! 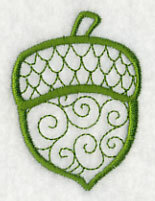 The design comes in two styles: Get the tutorials for stitching the stitch-filled design here and the applique version here. 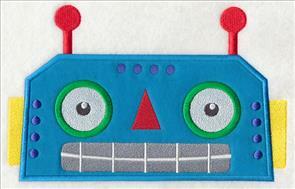 8.53" x 5.15" and 6.87" x 4.15" and 3.90" x 2.37"
A peeking robot is an equally adorable design for hats, quilts, and more. 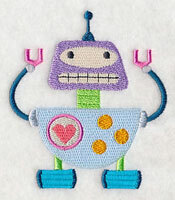 Learn how to stitch the stitch-filled robot here, and the applique robot here. 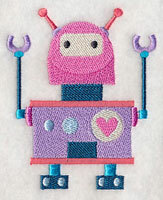 8.51" x 5.38" and 6.86" x 4.33" and 3.86" x 2.46"
Monsters and robots -- oh my! 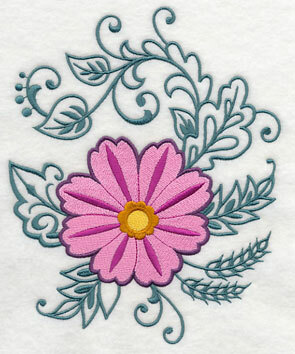 Each of these colorful "on-the-edge" designs are a great way to add fun and flair to your next embroidery project. 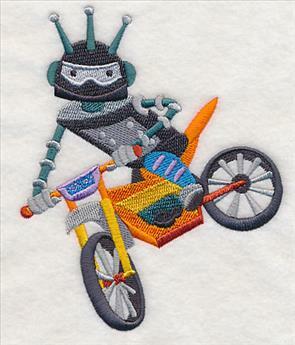 Whip up this colorful quilt, embroider the hood of a towel or sweatshirt, or embellish the bottom of a tote bag or t-shirt with these fabulous designs. 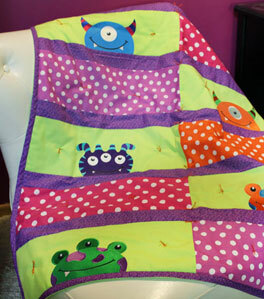 Click here to learn how to make this adorable monster quilt! 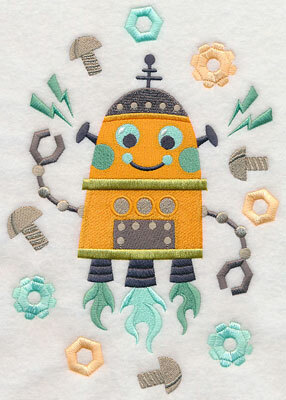 Retro robots surrounded by cogs, screws, rockets, and more are a delightful addition to a variety of kids projects. 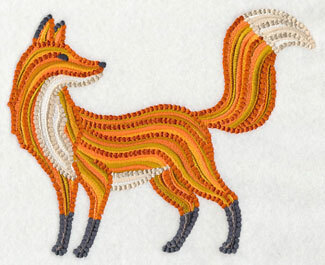 They're terrific stitched on tote bags, wall hangings, and more! 6.80" x 9.75" and 5.45" x 7.79"
6.87" x 9.74" and 5.50" x 7.80"
4.85" x 6.84" and 2.77" x 3.90"
Each of the four retro robots is made up of different materials and has an entirely unique look. 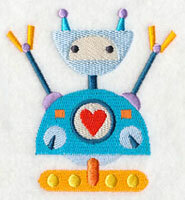 Stitch them together to make a series of pillows or framed pieces, or choose your favorite robot to stitch alone. 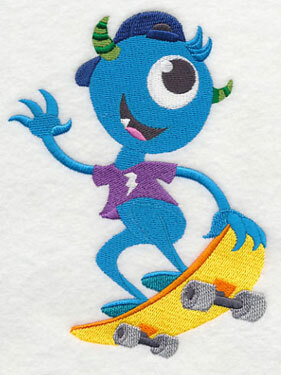 6.89" x 9.61" and 5.58" x 7.78"
6.89" x 9.68" and 5.55" x 7.80"
4.86" x 6.83" and 2.77" x 3.90"
A furry monster scoots his way over to his skateboarding friend. 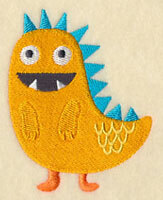 These monsters on-the-go are adorable additions to backpacks, book bags, sweatshirts, and more. 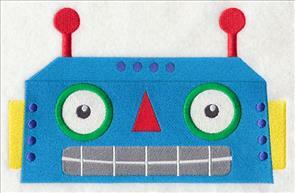 4.85" x 6.36" and 2.94" x 3.85"
If you prefer robots to monsters, try these guys on for size! A rollerblading robot has a jolly good time; a daredevil robot rides on his dirt bike. 4.84" x 5.96" and 3.14" x 3.86"
Bright colors, fun patterns, and silly additions (striped horns? a green tongue?) 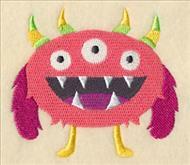 give this trio of silly monsters a charming and colorful style. 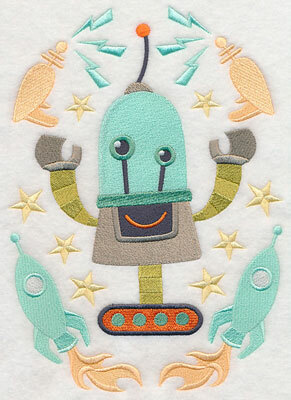 It's a too-cute addition to t-shirts, sweatshirts, and more. 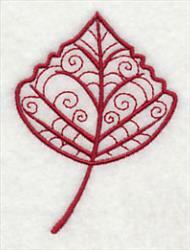 New to stitching on sweatshirts? 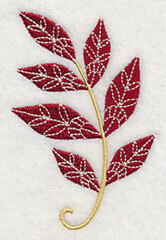 Get our top tips and tricks in this Fabrics 101 article right here. 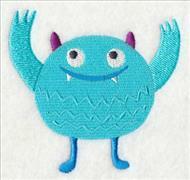 11.00" x 3.68" and 9.41" x 3.15" and 7.81" x 2.62" and 6.85" x 2.30"
Stitch the friendly monsters on their own, too! 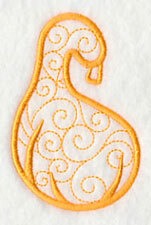 They've each been separated out for individual purchase and are sweet additions to any project. 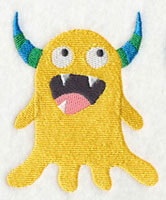 3.68" x 3.61" and 2.30" x 2.25"
Whether you're a fan of a yellow monster with horns, a big blue monster, or a monster with a heart on its belly, these cute-as-a-button creatures will be a delightful addition to your next embroidery project! 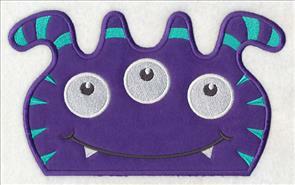 11.00" x 4.32" and 9.42" x 3.70" and 7.82" x 3.07" and 6.87" x 2.70"
Single designs featuring each of the monsters have been separated from the trio above and are all sold separately. 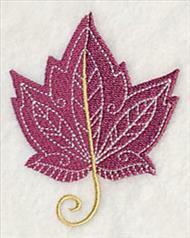 Use them to complement the trio on a jeans pocket or shirt sleeve, or stitch as stand-alone designs. 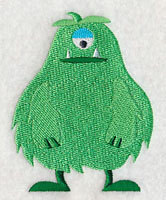 3.59" x 4.32" and 2.24" x 2.70"
These three friendly monsters are not-so-scary additions to a variety of embroidery projects. 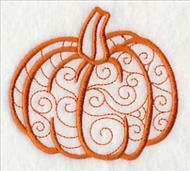 Stitch them on apparel, towels, aprons, quilts, and more! 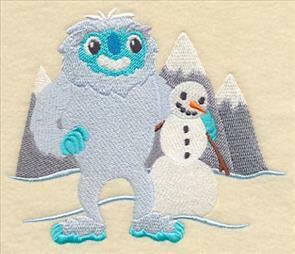 11.00" x 4.06" and 9.41" x 3.48" and 7.81" x 2.89" and 6.85" x 2.54"
Get each of the single designs featuring these furry monsters to stitch in conjunction with the trio above. 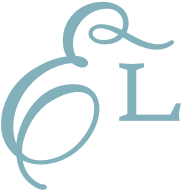 They're a terrific way to add extra fun appeal to your projects. 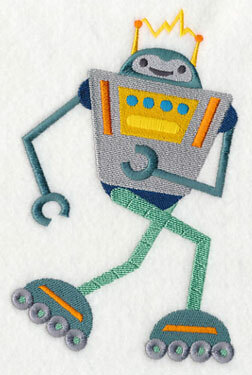 4.34" x 3.23" and 2.70" x 2.02"
It's a robot ruckus! 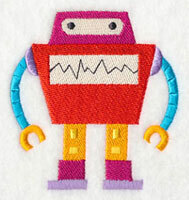 This trio of rowdy robots are a fabulous addition to t-shirts, sweatshirts, and other apparel. 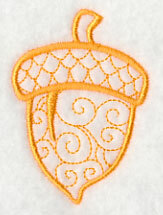 Learn more about stitching on sweatshirts here. 11.00" x 4.48" and 9.41" x 3.83" and 7.81" x 3.18" and 6.86" x 2.80"
Each of these fun robots has been created singly, and are available for individual purchase, too. Use them together with the trio for a matching set. 3.47" x 3.90" and 2.22" x 2.50"
Eeep! 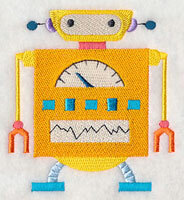 Give these robots a place to live on one of your embroidery projects! 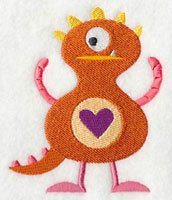 They're terrific additions to kids' gear and decor. 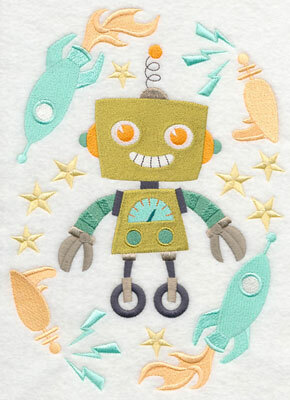 11.00" x 4.20" and 9.41" x 3.59" and 7.81" x 2.98" and 6.85" x 2.62"
Single designs featuring these robots have been separated from the trio above and can all be purchased on their own. Give them each a place to shine on your next project. 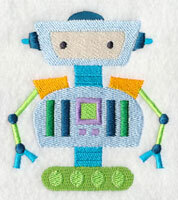 3.24" x 3.90" and 2.09" x 2.52"
Add a fun and futuristic look to garments and home decor with this trio of little robots. 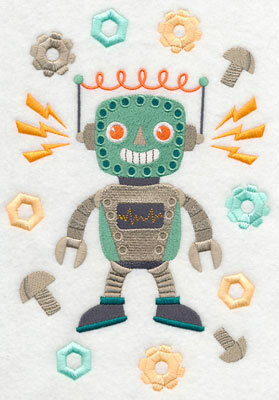 They're cute-as-a-button, and awesome on tote bags, pillows, and more! 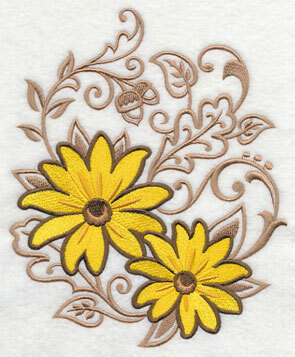 This trio is especially sweet on sweatshirts and t-shirts -- learn more about stitching on sweatshirts here. 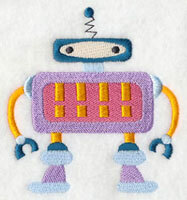 11.00" x 4.13" and 9.42" x 3.54" and 7.82" x 2.94" and 6.86" x 2.58"
Ready to stitch one of these robots alone? You're in luck -- they've each been separated from the trio above and are available for individual purchase. 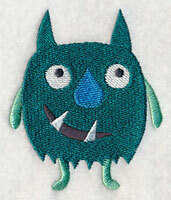 3.82" x 4.13" and 2.39" x 2.58"
Stitch a scene of one of your favorite monsters! 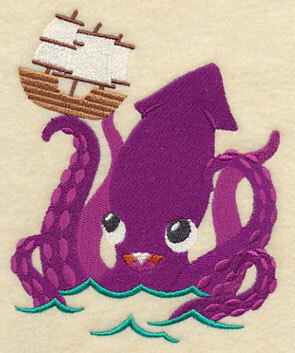 The Kraken, or sea monster from the deep, plays with a ship on the open water. 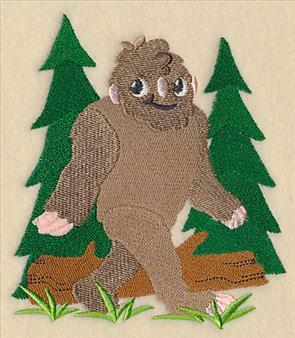 Sasquatch (also known as Bigfoot) takes a delightful stroll through the woods. 4.85" x 5.74" and 3.29" x 3.89"
Here, the Loch Ness Monster, nicknamed Nessie, goes for a light swim; the Abominable Snowman (or Yeti) builds a snowman. 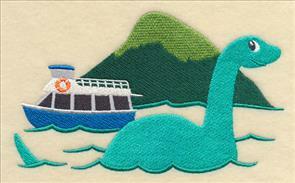 Stitch these scenes on pillows, tote bags, wall hangings, framed pieces, and more! 5.70" x 4.86" and 3.89" x 3.32"
Shirley is a big fan of the growing collection of sugar skull designs on the website, and was looking for another! 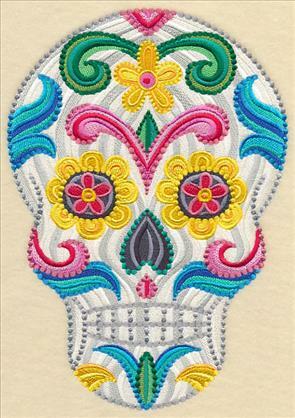 We loved the idea, and decided to create a sugar skull featuring lots of bright color and intricate stitching. Thanks for the idea, Shirley. 6.88" x 9.76" and 5.48" x 7.78" and 4.83" x 6.85"